The dosage in a clear easy-to-understand format. Before adding items it is good to set up the standard purpose, instructions and item photo for common items at least. 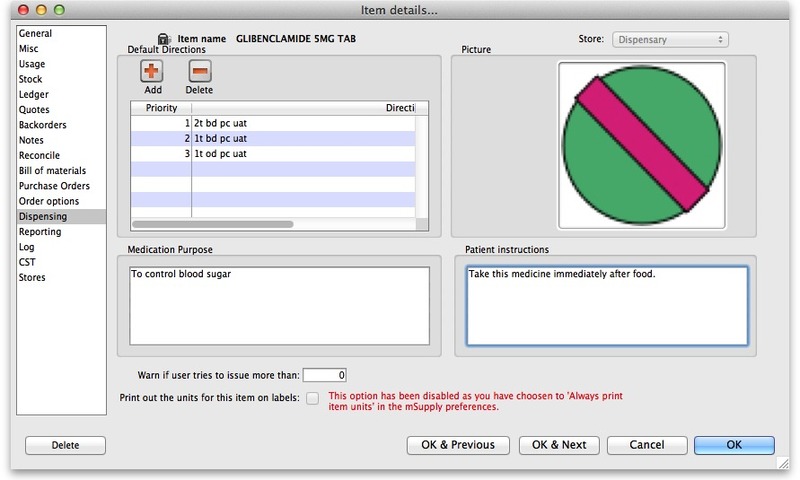 Once set up, you can add these to a particular patient's PMR with just the click of a button. Enter purpose and instructions. Both these fields can take as much text as you wish to enter. Add a photo by either dragging a photo from another application or pasting a photo from the clipboard. mSupply will automatically resize large photos when you add them- there is no need to resize photos yourself first. 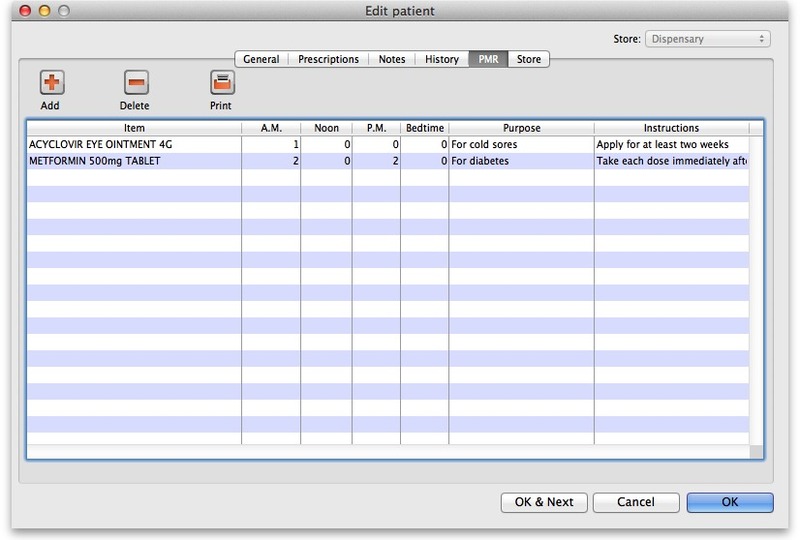 Highlight the items from the patient's history you wish to add, then click the Add to PMR button. The record will be shown on the “PMR” tab if you switch to it. 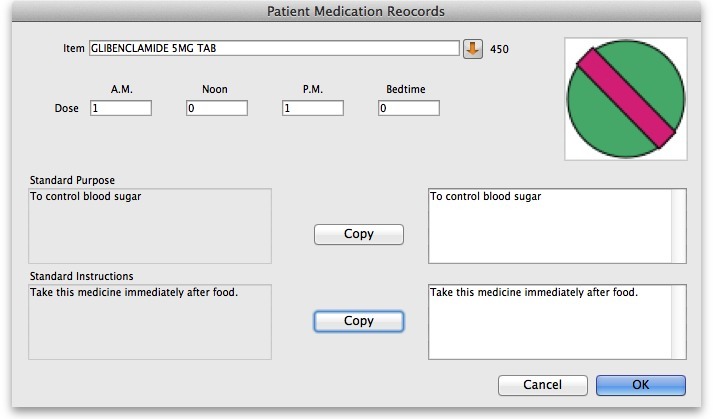 Note that on the PMR tab you still have to double-click on the added record and fill in the dose, instructions etc. Here you can add any item that is in the mSupply catalogue. For example, a patient might be regularly taking paracetamol or aspirin that they buy themselves. You can add such items here. Dosage: Enter the number of tablets/drops/whatever to be taken/administered morning, noon, evening and bedtime. Purpose: If the item has a purpose entered, click the copy button to copy it to the right-hand box. Here you can edit the details if you want to. Instructions: If the item has instructions entered, click the copy button to copy them to the right-hand box. Again, you can edit the details if you want to. Click OK when you're done, or cancel if you decide not to add a record. When a PMR is printed, it has a header and footer. 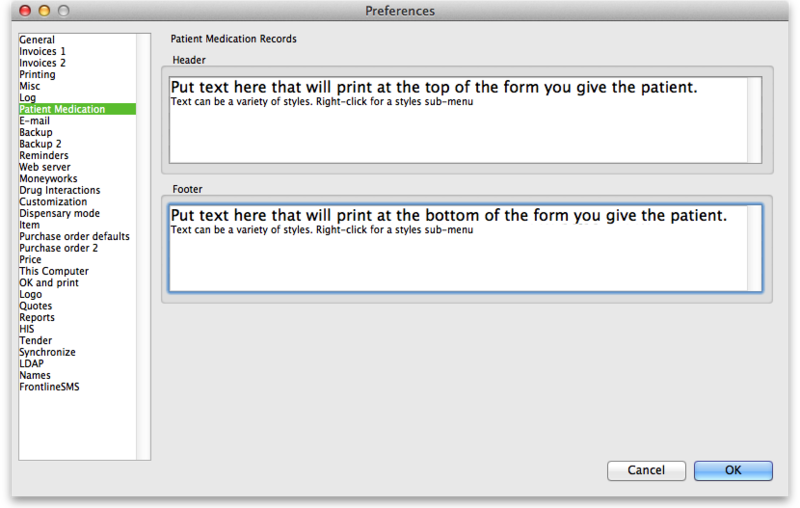 These are set up by choosing File > Preferences and then clicking the Patient Medication tab. Note that you can style the text in these boxes by selecting text and right-clicking on your highlighted text to get a contextual menu to apply font styles, colour and size. Simply click the Print button. Note that you do not have to highlight records- all records will be printed. Currently we have included a single PMR printing form in mSupply. We are happy to include others- send us your designs. Previous: Warnings Next: Why an HIS module for mSupply?